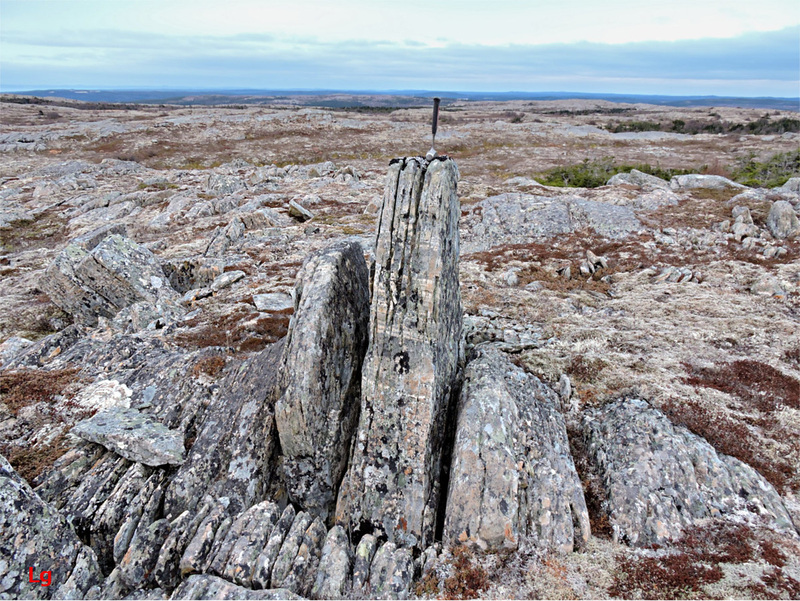 Note: The material provided below predates recent observations leading to the conclusion that bedrock disruption by ice on Newfoundland's Avalon Peninsula occurred in a subglacial environment. The following discussion remains relevant in considering instances of subaerial bedrock frost heave that can be found in many parts of the world. Just as there are no glaciers presently on the Island of Newfoundland, there are also no areas of permafrost. 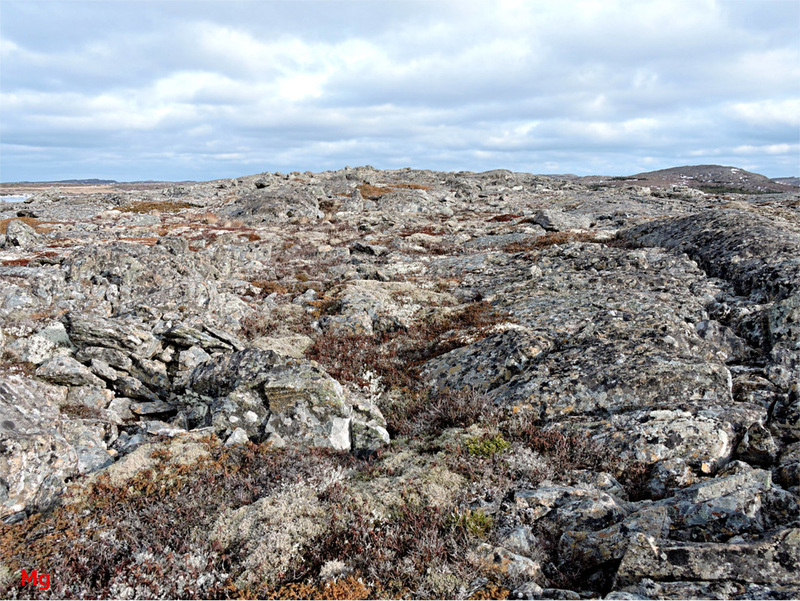 However, some areas bear close resemblance to present-day periglacial environments found in Canada's Arctic regions. These areas hint at a much colder, but unglaciated landscape having existed in parts of Newfoundland in the geologically recent past. Without protective ice cover, temperature differences between summer and winter will set up strong thermal gradients in bedrock, allowing frost wedging to chaotically disrupt the surface. The active layer in a permafrost environment is the layer extending from the surface down to the maximum depth of seasonal ground thaw. Although surface temperatures typically reach an average maximum in July in the northern hemisphere, there is a time delay of months before heat from the surface can diffuse to depths of even a few metres. Thus, by the time temperatures reach maximum and begin to cool at depth, layers of rock near the surface have already cooled well below freezing. This delayed freezing at depth leaves liquid groundwater that can be drawn toward the colder, frozen surface, causing frost wedging and frost heave by the ice segregation process or, in limited cases, can disrupt rock solely by the 9% volume expansion accompanying freezing. The diagram below shows a theoretical depth profile for a seasonal temperature swing of +/-10 deg. C about an average annual temperature of -10 deg. C in pure glacial ice. The above diagram does not show the boundaries of an active layer in bedrock permafrost, but rather shows only the general shape and scale of the temperature-swing vs. depth curve. The thermal diffusivity of rock differs from that of ice and, for purposes of the illustration, the indicated temperature range has been kept entirely below freezing as required in a body of ice. In rock, the temperature can rise far above freezing, driving heat to depth more rapidly. In trade off, however, the melting of any ice present in the rock absorbs heat (the heat of fusion of ice), slowing temperature increases at depth. Observations of disrupted bedrock in Heart of Avalonia imply an active layer about 3 metres deep in many areas. Ice segregation describes a physical process comprised of two key components. Firstly water is maintained in a liquid state (premelted ice) by the barrier to crystallization imposed by close proximity to a foreign (non-water) surface. Secondly, this non-crystalline water, existing at a temperature below 0 deg. C, is drawn toward regions of lower temperature by capillary action, whereupon it crystallizes onto the surface of an already-present ice mass, increasing the size of this ice mass. Heat flow across a thermal gradient can be converted to mechanical work by this process, this work comprising rock displacement, hence frost wedging. Ice segregation is the most effective and versatile method by which water and ice, coexisting in a thermal non-equilibrium environment (temperature gradient) can disrupt bedrock. Ice segregation is thus a key periglacial process. Further discussions of ice segregation can be found in Properties of Ice and in Mechanisms for Bedrock Frost Heave. The following diagram illustrates the ice segregation process in a generalized (soil or bedrock) environment. Ice segregation in bedrock is hard to visualize while in progress. In soils, however, needle ice provides a convenient illustration of ice segregation on a small, but easily visualized scale. Each of the photos below show needle ice. Needle ice can form via ice segregation when wet porous soil is exposed to sub-freezing winter temperatures. Its formation does not require a periglacial environment. Water wicks up through pores in the soil and freezes at the tops of the needles. As shown in the second picture, small pebbles can be displaced upward in a micro frost-heave process. As discussed above, the active layer in a permafrost environment provides conditions strongly promoting frost wedging and frost heave. The first photo (left) below shows a large frost-heaved joint block (hammer is 27 cm long). The size of this feature suggests deep ground frost, with an active layer extending at least 2 metres down. The small frost-heaved blocks shown in the second photo (right) below could theoretically have been pushed upward by near-surface ground frost forming during the winter months in today's temperate climate. However, lichen growing on the sides of these blocks indicates that they have undergone little or no upward motion within the last 25 years (see Lichen Analysis). Furthermore, the area close to where these specimens occur has been highly disrupted by deep frost wedging, with numerous large frost-heaved blocks and frost-heaved mounds nearby. The two small blocks sit above a long joint, slightly frost-widened, which probably extends downward to a considerable depth. 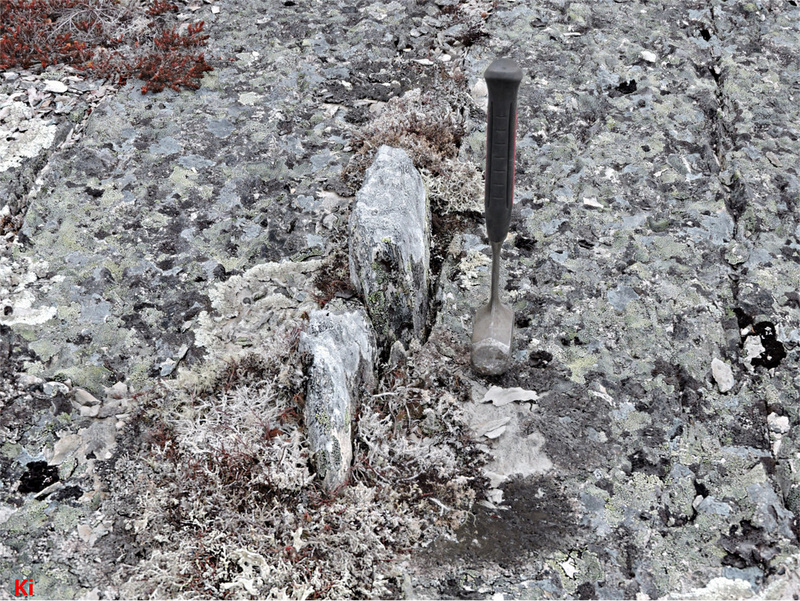 These joint blocks may, like the large joint block shown in the first picture, reflect a relict periglacial environment with a deep active layer. For a fissure to form, water must continuously or repeatedly enter a joint and freeze. Ice segregation is the most likely mechanism by which a steadily accumulating volume of ice can gradually widen a joint. The action is unlikely to simultaneously occur top-to-bottom since ice segregation is driven by a thermal gradient, the seasonal thermal gradient being always vertical. Thus, ice would tend to accumulate at different depths during different seasons, the coldest point in the vertical column being the preferential point for ice accumulation. All accumulating ice would contribute to the same net effect, which is widening the joint. The stiffness of the rock unit would transfer locally-generated stress to areas above and below the zone of ice accumulation. The formation of a fissure causes an expansion of the volume of the region of bedrock in which it forms. Fissures are thus less common in wide, flat bedrock areas, where instead, upward frost heave is preferred. Some fissures are seen in flat areas, however, and in these cases the surrounding bedrock must either be compressed or buckled. Fissures are more common in areas approaching downslopes where bedrock can be displaced horizontally to accommodate a widening joint. 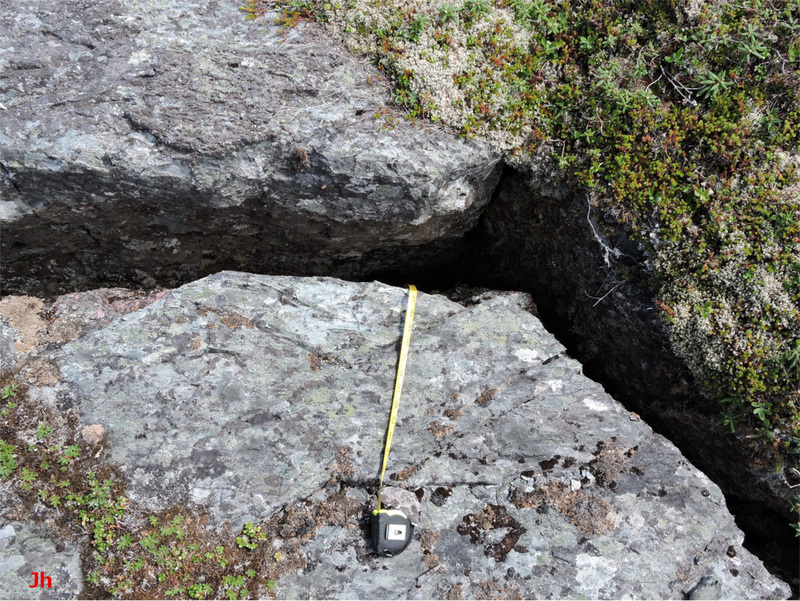 It is not uncommon to see bedrock volumes in the tens or hundreds of cubic metres pushed sideways by fissure development. Abundant fissures near the edge of a steep slope or cliff can give rise to a feature resembling plucking. Glacial ice movement and/or frost wedging may play a role in the development of these hillside features. ​Other aspects of a periglacial environment also facilitate large-scale bedrock disruption. Permafrost helps confine groundwater and can enable maintenance of a water table at local elevations higher than would be possible if free drainage of water through the ground were permitted. A local aquifer provides an abundant source of liquid water to drive large-scale frost wedging. Additionally, permafrost extending a few metres or tens of metres below the surface can confine a pressurized aquifer existing at lower depths. In this way, artesian groundwater can be routed over substantial distances, potentially causing large-scale bedrock disruption when it reaches the surface. In this type of scenario, it becomes difficult to differentiate between periglacial frost-wedge phenomena and cold-based glacial or even warm-based glacial rock disruption.